Can a wrist watch cost a million dollars? Actually, a wrist watch can cost 25 million dollars. Here is the 25 million dollar watch. What do the $25 million pay for? 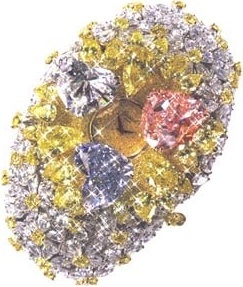 As you can see, the watch's time piece is almost buried under three enormous diamonds - pink, blue and white - that respectively weigh 15, 12 and 11 carats. An additional 163 carats of less enormous yellow and white diamonds cover the strap, which can't even be seen. The time piece of this watch, created by Chopard, is a poorly disguised pretext for wrapping and flaunting 201 carats of diamonds around a woman's endangered wrist. The second most expensive watch in history resulted from a 20th century ego fight between Henry Graves, a New York banker, and James Packard, a Ohio car maker. For over a decade, Graves and Packard commissioned custom watches that topped the last one commissioned and worn by the other. The watch that eventually won this epic wrist race was a 1933 Patek Philippe that required 3 years to design, 5 years to make and sold at a Sotheby's auction in 1999 for $11,000,000. Hublot, Vacheron Constantin and Blancpain also make watches that cost more than $1 million. They require intricate components and workmanship. Blancpain 1735, for example, has 750 components and requires a year to assemble. 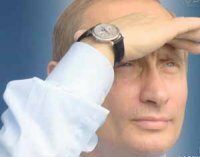 Two of today's best known watches belong to Vladimir Putin of Russia and Italy's Silvio Berlusconi. Putin's watch is a $60,000 Patek Philippe (above), while Berlusconi wears a $540,000 Vacheron Constantin. Piaget, Cartier, Audemars Piguet, Baume & Mercier, Breitling and Rolex also make watches in this price range. So, which watch should you buy? That depends on your views on wealth and politics. Please click on Bill Clinton watch if you believe your wealth is the result solely of your endeavors and genius, and click on George Bush Timex if you believe that your wealth is a blessing.